One of the beautiful things about Rosewill's line of mechanical keyboards is that they're about as close to pure as you could conceivably get. They're not fancy, not tarted up by any stretch of the imagination, but instead simple, clean designs that afford the end user a tremendous amount of choice. Their basic RK-9000 series is available in four different varieties of Cherry MX switches, and today we round out our experiences with the different switches with the "special edition" RK-9000I with Cherry MX Blue switches and a white trim. That said, if you want to go fancier, Rosewill has produced a remarkably stylish yet still fairly minimalistic keyboard in the form of the Illuminated Mechanical Gaming Keyboard, available with both Cherry MX Blue and Cherry MX Brown switches. This is a pricier product, but features mechanical switches and LED backlighting across the board along with a couple of other nifty features. At an MSRP of $119, though, it's contending with my personal favorite, the Corsair K90. Does Rosewill offer enough with this premium product, or did their reach exceed their grasp? Rosewill sent me these two keyboards for review, and marketed the RK-9000I (and the whole I series) as special edition keyboards. 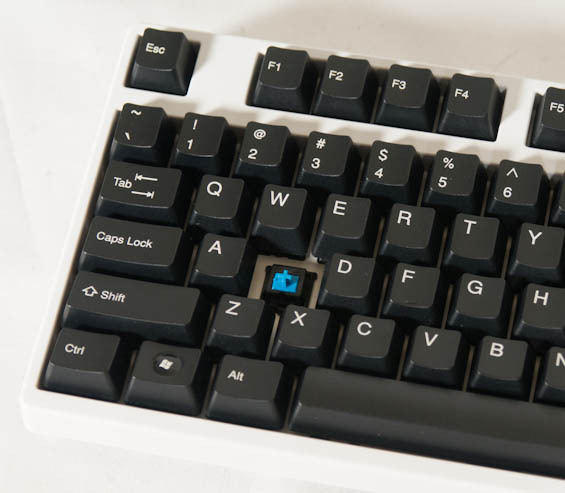 That said, the RK-9000I is a Cherry MX Blue keyboard that features a white backplate and trim instead of the black one on their normal keyboards. The I series, like the gaming keyboard I'll get to in a moment, only comes with two varieties of switches: Cherry MX Blue, and Cherry MX Brown. This is in contrast to their basic black mechanical keyboard that also comes with MX Reds or MX Blacks. However, because we've already reviewed their basic MX Blue keyboard, there isn't a whole lot to add here. The only difference between this version and the previous one is the white trim; everything else is the same, including the keycaps. My experience was generally positive; I'm not convinced the lettering on the keycaps is particularly long-lasting, but the switches themselves should be. That said, I'm still of the opinion that Cherry MX Blues are pretty much strictly for typists and word processing. The way they actuate makes them unsuitable for doing double-taps or other fast inputs in more intense games. Where I think Rosewill does bring excellent value (beyond the $65 asking price with promo code) is that this fairly basic keyboard includes detachable cables so that you can use either PS/2 or USB 2.0. The fact is that ghosting can still be an issue (it pops up irritatingly frequently with my K90), so the option to employ PS/2 is much appreciated. There are alternatives to this grossly overused phrase - at least enough so that it needn't appear three times in four paragraphs. FN key combos are not actual keys. They are alternate key functions. This is one of the reasons I have and will stay with my MS Comfort Curve 2000 until someone comes out with one like it with RED led back lights.